Don’t be fooled by the “easy” in this category title. It doesn’t refer to “easy terrain” but to “easy cruising.” The category is all about effortlessly travelling across the slope on a smooth, surefooted ride, one that delivers the assurance and confidence needed to explore all the possibilities in front of you. These fun, intuitive and engaging skis provide a positive all-day experience, allowing a skier to relax in comfort and enjoy the snow. Easy Cruisers burst with operational simplicity as you discover new potential. The lineup was created to painlessly maximize your winter enjoyment. 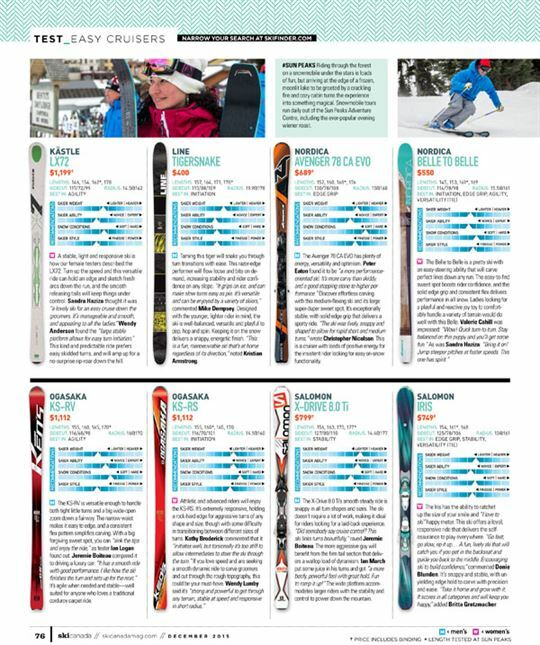 So whether you’re interested in exploring the slopes on your own agenda or arcing trenches to display your alpha mountain stature, look closely at our test-ski reviews. Delve into what manufacturers brought us this year to find what best matches your personality and on-snow needs. Your true potential starts here. MEN: This sparky ski delivers punch and reliability, holding speed throughout the turn without the fight you might expect from a shiny Blackeye. It’s well suited for carving and maintaining excellent speed around the arc, and the big sweet spot makes it easy to use. “The ski likes to be driven and can handle some speed. It’s best suited for strong intermediate or advanced riders,” highlighted Ian March. John Storey commented that “edge-to-edge it’s fast and smooth. Short turns are dynamic and stable, and long turns are smooth and sweet.” Those who like to cruise and take the slope less travelled will relish this little beauty. WOMEN: The Cloud Eleven XT is a fun ripper that enjoys speed and delivers confidence with its commanding edge hold and ability to carve, as tester Donie Blunden confirmed: “Tip and grip, it’s as versatile as a Magic Bullet—this one does it all.” The slightly stiffer flex appeals to the heavier more aggressive rider, yet the forgiving all-round adaptability of the ski is friendly enough for beginners to improve their skills. With “a slightly racy feel, it loves to be on edge and carving. It’s smooth, solid and stable underfoot, giving you the confidence to let it rip on groomers,” wrote Heather Robilliard. MEN: Tester Kelly Blunden enjoyed the Power X7 Ti, commenting that it’s “stable and lively, giving instant feedback and control” to encourage hard carves and fast turns. The edge engages high in the turn, preserving speed and balance. The ski is ideally suited for hard snow, with the ability to maintain speed for an exhilarating ride no matter the slope. Kristian Armstrong said “it felt like a detuned slalom ski. There’s a lot of punch when needed. It will be there for you as your skills improve.” This ski is a highly versatile solution for those skiers looking to improve their game and expand their boundaries. WOMEN: The light Viva X7 Ti shines with its magnetic personality and a consistent edge hold that carves easily over diverse terrain. Lightweight Wendy Lumby found the ski was “so easy to turn. It loves short turns, so there’s no need to go fast.” A big sweet spot and stiff tail keep everything stable and supportive throughout the turn, while the soft tip makes initiating and transitioning between turns a breeze. Kathy Broderick liked the “nice flotation in a such a lightweight ski.” This would be a perfect ski for the intermediate rider looking to graduate to more challenging slopes. MEN: Elan knows how to make hard turns easy. This ski offers a super-responsive ride, and is more suited to intermediate and advanced guys. Tester Peter Eaton commented that it has “very good initiation; get centred and it will start the turn for you.” With its light weight and lots of flex, “it’s a great teaching ski. You can do it all. It holds well on ice, carves and you can easily slide your turns,” according to Mike Dempsey. Though designed with a friendly attitude to go everywhere, the ski is less effective in rugged, choppy terrain, but it’s home sweet home on icy hardpack. MEN: The Raw Instinct is “predictable, confidence-building and smooth—like skiing with an old friend,” wrote Ian Logan on his test card. This fun cruiser is torsionally solid with rubber-band rebound to make fresh corduroy so much fun. It’s strong and light, and as Rodger Poole discovered, you still get “a solid ski that’s great for going fast and doing big turns.” Intermediate to advanced skiers will smile all day long as they carve groomers and snoop around in the trees and bumps, or buck up and giv’er—this one is solid. It has the ability to ease into a turn and deliver all-day reliability. WOMEN: Creamy, dreamy and smooth, the Absolut Joy travels down the mountain with style, grace and speed. “It’s yours to cruise anywhere you want. This is a keeper for years to come,” commented Britta Gretzmacher. It’s remarkably lightweight, with a soft tip to create a highly manoeuvrable all-terrain machine for riders looking to venture out in any snow conditions. Set the cruise control and arc short to medium turns down a smooth groomer with comfort and stability. “You can even relax into the backseat, like a comfy chair—the ski just carries you,” added Donie Blunden. Non-aggressive females will get the most out of this ski. MEN: The iKonic 80 delivers unbeatable performance and all-day enjoyment. Tester Kelly Blunden found it was “very easy to start a turn, and at the same time holds the edge and lets you carve.” It’s extremely stable and fun to bend, and its predictability make it ideal for those looking for an easy-to-use, go-anywhere performer. John Storey noted that the “ski was stable and had a wide sweet spot,” giving those looking to explore more of the mountain the assurance that the ski won’t let them down. Riders will be pleasantly surprised with its versatility and buoyancy for a fun, reliable experience. MEN: The LX82 is a super-light ride with a soft flex that delivers zingy fun in and out of a turn. It’s ideal for those tight, wicked little turns either on the groomers or in the trees. 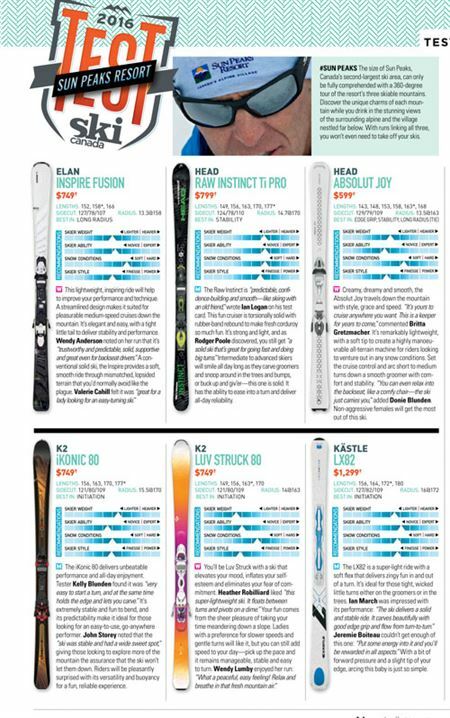 Ian March was impressed with its performance: “The ski delivers a solid and stable ride. It carves beautifully with good edge grip and flow from turn-to-turn.” Jeremie Boiteau couldn’t get enough of this one: “Put some energy into it and you’ll be rewarded in all aspects.” With a bit of forward pressure and a slight tip of your edge, arcing this baby is just so simple. WOMEN: A stable, light and responsive ski is how our female testers described the LX72. Turn up the speed and this versatile ride can hold an edge and sketch fresh arcs down the run, and the smooth releasing tails will keep things under control. Sandra Haziza thought it was “a lovely ski for an easy cruise down the groomers. It’s manageable and smooth, and appealing to all the ladies.” Wendy Anderson found the “large stable platform allows for easy turn initiation.” This kind and predictable ride prefers easy skidded turns, and will amp up for a no-surprise rip-roar down the hill. MEN: Taming this tiger will snake you through turn transitions with ease. This razor-edge performer will flow loose and bite on demand, increasing stability and rider confidence on any slope. “It grips on ice, and can make slow turns easy as pie. 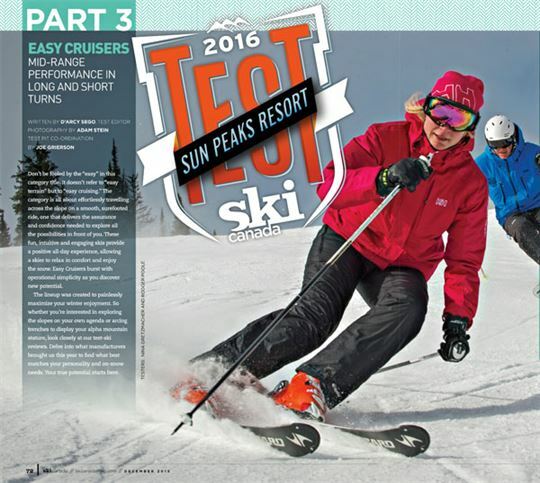 It’s versatile and can be enjoyed by a variety of skiers,” commented Mike Dempsey. Designed with the younger, lighter rider in mind, the ski is well-balanced, versatile and playful to pop, hop and spin. Keeping it on the snow delivers a snappy, energetic finish. 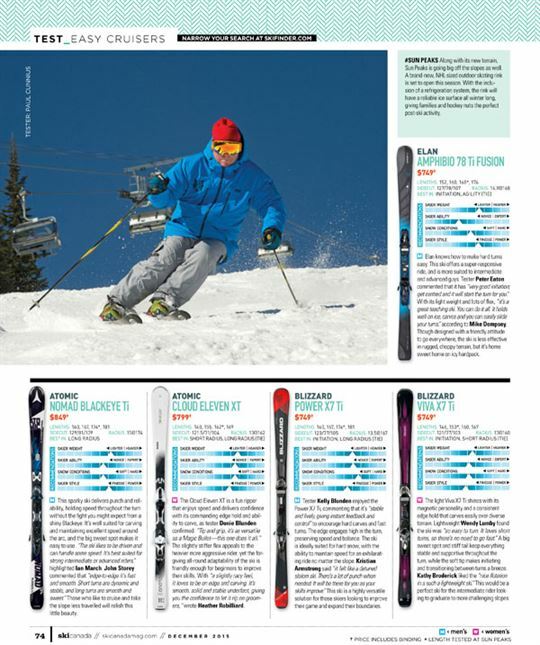 “This is a fun, manoeuvrable ski that’s at home regardless of its direction,” noted Kristian Armstrong. MEN: The Avenger 78 CA EVO has plenty of energy, versatility and optimism. Peter Eaton found it to be “a more performance-oriented ski. It’s more carvy than skiddy, and a good stepping stone to higher performance.” Discover effortless carving with this medium-flexing ski and its large super-duper sweet spot. It’s exceptionally stable, with solid edge grip that delivers a sporty ride. “The ski was lively, snappy and shaped to allow for rapid short and medium turns,” wrote Christopher Nicolson. This is a cruiser with loads of positive energy for the insistent rider looking for easy on-snow functionality. MEN: The KS-RV is versatile enough to handle both tight little turns and a big wide-open zoom down a fairway. The narrow waist makes it easy to edge, and a consistent flex pattern simplifies carving. With a big forgiving sweet spot, you can “sink the tips and enjoy the ride,” as tester Ian Logan found out. Jeremie Boiteau compared it to driving a luxury car: “It has a smooth ride with good performance. I like how the ski finishes the turn and sets up for the next.” It’s agile when needed and stable—well suited for anyone who loves a traditional corduroy carpet ride. MEN: The X-Drive 8.0 Ti’s smooth steady ride is snappy in all turn shapes and sizes. The ski doesn’t require a lot of work, making it ideal for riders looking for a laid-back experience. “Did somebody say cruise control? This ski links turns beautifully,” raved Jeremie Boiteau. The more aggressive guy will benefit from the firm tail section that delivers a wallop load of dynamism. Ian March put some juice in his turns and got “a more beefy, powerful feel with great hold. Fun to ramp it up!” The wide platform accommodates larger riders with the stability and control to power down the mountain. WOMEN: The Iris has the ability to ratchet up the size of your smile and “I love to ski” happy meter. This ski offers a loyal, responsive ride that delivers the self-assurance to play everywhere. “Go fast, go slow, rip it up… A fun, lively ski that will catch you if you get in the backseat and guide you back to the middle. Encouraging ski to build confidence,” commented Donie Blunden. It’s snappy and stable, with unyielding edge hold to carve with precision and ease. “Take it home and grow with it. It scores in all categories and will keep you happy,” added Britta Gretzmacher. MEN: The Beta will easily flow through a wide variety of turn shapes and snow conditions to provide outstanding performance on smooth terrain. John Storey enjoyed his run: “Terrific ride, cranks a short turn with great response, and arcs medium and long turns with edge grip and hold.” This is a responsive, stable ride that likes adventure. “Torsionally forgiving, and it gets better in the softer snow at speed. It’s meant for large turns and soft-snow conditions,” wrote Kelly Blunden. Extremely agile, this cruiser can charge with the best of them, and play in soft, snowy conditions without ever complaining. radius turns. “This cruiser is as fun as it gets. Nice sweet spot right in the middle, with predictable flex to offer up a smooth ride,” commented Kathy Broderick. Wendy Lumby noted, “It’s harder to initiate a turn going slowly. Once a bit of speed happens, it rolls over with ease.” The Alpha is a bit heavier underfoot, and not surprisingly, like a lot of things, the faster you go, the better things get. MEN: Versatile in all conditions from racecourses to bumpy terrain, the RTM 78 has a nimble, fun design for cruising down a mountain. The edge grip provides stability and grants the comfort and confidence needed to push skill boundaries. “One of my favourite skis on groomed corduroy. It’s precise and zipped from one arc to the next,” wrote Christopher Nicolson. “It prefers carved turns and is best when laid over on a strong edge,” added Peter Eaton. Both light riders looking to finesse their way down the slope, and big, powerful carvers craving tight turns and bursts of speed will enjoy this ski. WOMEN: The Chiara delivers a bright little ride with a clear purpose. Heather Robilliard found it to be “fun, lively and easy to ride. Perfect for this category. You’ll love this progressive turner.” It’s lightweight, stable and picks up speed fast to slice up blue and black runs like a turkey dinner. For many, this will be a game-improvement changer that effortlessly dominates the frontside. Britta Gretzmacher commented, “It’s smooth and easy, excelling on steeper terrain.” Lightweight and athletic skiers looking to carve quickly down the mountain or go off-piste for a more rugged adventure will enjoy this one.